Karl Otto Lagerfeld is said to have been born in 1933 in Germany but an exact date has never been confirmed with Lagerfeld after claiming he was neither born in 1933 nor 1938. Karl moved to Paris the fashion capital of the world at the young age of 14. In recent interviews it was revealed he hated being a child and couldn’t wait to grow up. Entering and winning a design competition for his sketch of a coat Lagerfeld finally had his foot in the fashion door. Pierre Balmain caught wind of Karl’s design and offered him the position of his personal assistant, immediately taking his award winning sketch to production. Lagerfeld moved onto creating designs for Jean Patou who was a top French designer at the time, creating two haute couture collections a year. In 1960 for their spring summer collection Karl designed a ground breaking skirt for the collection which was later titled the shortest skirt in Paris. It was the year of 1965 when Karl Lagerfeld joined the Fendi family. Karl was offered the job of creative director for the luxury fashion house. He began by overseeing designs for fur lines, accessories and ready-to-wear collections. To this day Fendi and Karl Lagerfeld are unapologetic for the use of furs. Karl believed the fur industry created jobs, nor did he see a problem with people eating meat or the use of leather goods which caused world controversy. Karl sketched the FF logo for Fendi which was reborn and took the fashion world by storm in 2018. Celebrities alike are now covered head to toe in the Fendi monogram thanks to Karl Lagerfeld. Karl had a fascination with beauty and youth by hand picking his models and keeping with the times by only using the current IT girls to showcase his latest designs. It wasn’t until 1983 that Karl was appointed creative director for the iconic fashion house Chanel; a position he held for the next 36 years. Karl described Chanel as a dying brand which he brought back to life by creating revolutionary suits with skirts and statement hats, Karl was known for being way ahead of his time. Lagerfeld felt it was his mission to reinvent previous designs and adapt them to modern life. Karl brought back the classic Chanel Little Black Jacket, pairing the statement piece with casual attire as opposed to full suit trousers. Lagerfeld was the true designer to create the interlocked double CC logo which is still incorporated into designs today. Karl prided himself on being heavily involved into every process of a design from sketching, to production, to campaign ideas and to finally photographing his personally handpicked models. Chanel AW16 Lagerfeld chose Willow Smith to be the face of Chanel for her youth, creativity and exuding confidence. The collection became an instant hit. Karl Lagerfeld was a true fashion icon across six decades of fashion. He single handedly shaped the fashion world as we know it. Never shy in voicing his policies, we see models marching down the runway with feminist placards in his Chanel SS/15 catwalk show. Karl Lagerfeld dedicated his life and soul to fashion. Shortly after Karl Legerfeld’ s death on the 19th February 2019 a statement was released by Chanel’s president of global fashion Bruno Pavlovsky it stated “Fashion show after fashion show, collection after collection, Karl Lagerfeld left his mark on the legend of Gabrielle Chanel and the history of the House of Chanel. The greatest tribute we can pay today is to continue to follow the path he traced by – to quote Karl – “continuing to embrace the present and invent the future”. 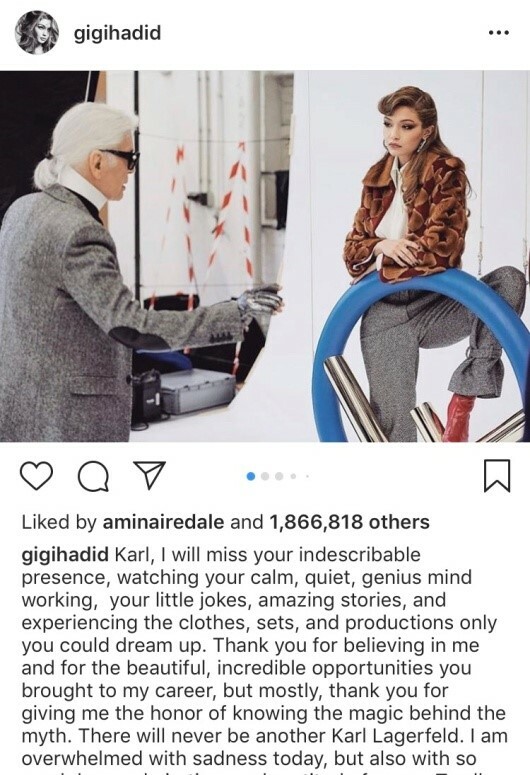 Fashion houses, public figures and models alike pay tribute to Karl across their social media platforms how he each individually touched their lives. 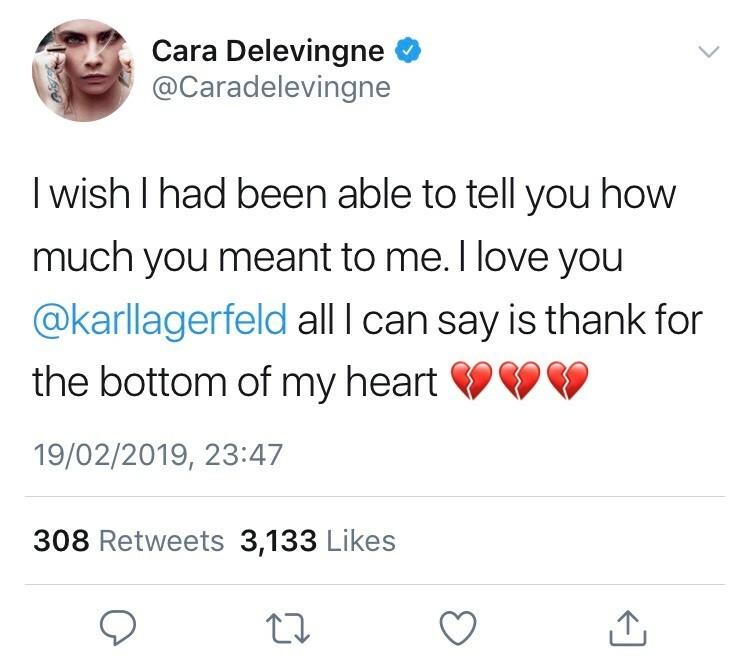 The entire fashion world was in deep mourning for the loss of fashion icon Karl Lagerfeld. Please click through to read some of the most poignant tributes.